From its glitzy beaches on the Atlantic Coast to the sleepy, pristine shores of the Gulf, Florida draws thousands of visitors—plus brides and grooms—each year who are in search of sun, sand, and turquoise surf. But that’s not all there is to the Sunshine State. Florida is also dotted with rustic farms and ranches, whose charming weathered barns and bucolic surroundings make for perfectly romantic wedding venues. We’ve rounded up 10 of our favorites for those of you who plan to save the beach for your honeymoon. Sprawling across 10 acres of Florida countryside, Cross Creek Ranch offers two unique outdoor venues: The Carriage Stable House, set against the backdrop of majestic oaks and Spanish moss, and The French Country Inn, with its intimate wedding gazebo and cozy butterfly garden. All-inclusive packages are available—including time for rehearsal, a bridal dressing room, and custom décor—and a wedding coordinator will handle every detail of the day. What you’ll love: For a grand entrance, a horse and carriage is available to bring the bride over the ranch’s bridge to the ceremony. Located in south Miami-Dade County, this spot occupies three acres and gives brides and grooms the best of both worlds: It oozes charm and elegance, but its rustic setting will make guests feel right at home in their bare feet—all the better for dancing the night away. Why you’ll love it: Landscape features include a sunken grotto with waterfalls; rare, exotic palms; and huge, mature oak trees (in other words, gorgeous photo opps galore). Owned by wedding photographer Sara Kauss and her husband, Zak, this Jupiter Farms ranch is situated on a serene lake and exudes an Old Florida feel thanks to its slightly untamed landscape of palms and its charming barn. 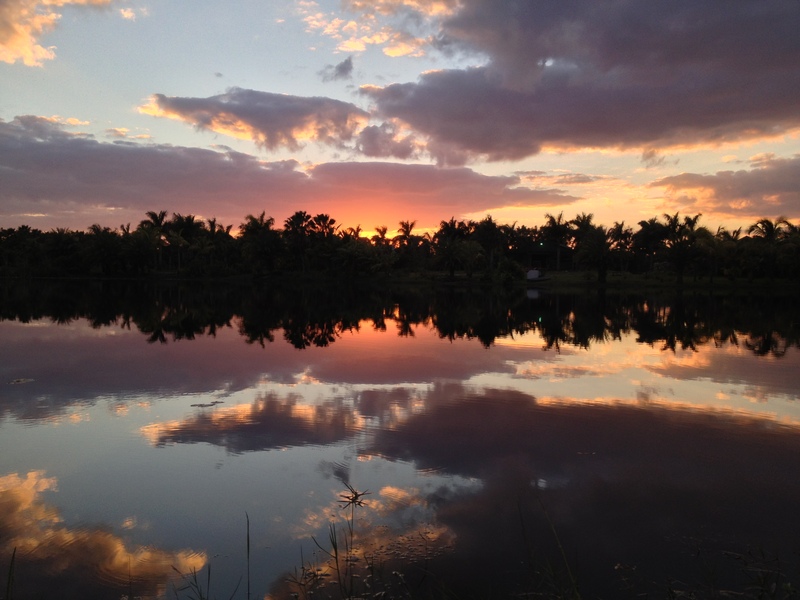 Why you’ll love it: Sunsets over the ranch’s lake are nothing short of magical. Nature reigns supreme at this stunning outdoor venue, which is located 30 minutes north of Tampa. The ranch’s rustic natural setting is complemented by event-ready amenities, from handmade wooden benches to a ceremony space tucked amid a grove of giant oaks. What you’ll love: The ranch’s hands-on owner is readily available to help, and couples can choose their own vendors. Just a short drive from downtown Tampa, The Lange Farm comprises 80 acres of verdant farm land and is home to two separate reception facilities—the plantation-style Garden House, with its wrap-around porch and crystal chandeliers, and the Antique Barn, a former working horse barn that now hosts indoor-outdoor receptions. What you’ll love: The property’s 80 acres are home to giant oaks and antique gazebos, giving you your pick of ceremony spots. Opened in Hillsborough County in 2016, Prairie Glenn Barn was dreamed up by a team of wedding professionals who wanted to offer couples a complete wedding experience. Measuring 104 feet by 54 feet, Prairie Glenn can accommodate weddings of up to 300 guests. The property, which is surrounded by oak forests, lakes, and pastures, also has a designated bridal suite and a dramatic entrance lined with towering oaks. What you’ll love: The newly constructed barn is climate controlled, so even on the muggiest of Florida nights, you and your guests can dance the night away in comfort. One of our favorite venues in this story, Saxon Manor, which is lovingly run and kept by Dorothea and Greg Stephens, combines Victorian-era elegance and Southern romance. The property is home to the painstakingly restored Saxon Scarborough House and offers couples its gorgeous Garden Room and charming Shabby Chic Barn for reception space. What you’ll love: With its dripping oak trees, couples can swap vows in a romantic outdoor ceremony before celebrating with friends and family in one of the two reception spaces decorated completely to their liking. Santa Fe River Ranch occupies 1,750 acres of land along the Santa Fe River in North Central Florida. Facilities at the working cattle ranch include a restored show barn, a new enclosed barn complete with a loft and spiral staircases, a timeless lodge, and majestic oak trees, the latter of which are a popular pick for ceremonies. The barn’s architecture is so wonderfully simple that the inside can be turned into any theme or place that a bride’s heart desires. What you’ll love: The ranch hosts just one wedding each week, which means you’ll have its staff’s undivided attention. Just outside of Gainesville, the quaint Verplanck Farmhouse sits on a five-acre private property that’s also home to two 1940s barns. There are no indoor ceremony or reception spaces, but a live oak canopy drive and beautiful countryside make for a most unique and picturesque setting. What you’ll love: You can hire any vendor you choose, and wedding packages include use of the venue for the entire weekend (think: pre-wedding barbecues, lawn games, and more). Decorative items like mason jar drinking glasses, hay bales, and a wine barrel drink bar are available to rent.